"Discover How You Can Increase Your Creativity With My Easy Step-by-Step Program!" This book contains the one secret key you'll ever need to unlock your creativity. Do you regret not finishing your paintings or scrapbooks? If any of these questions make you stop and think... then I have the perfect e-book for you. 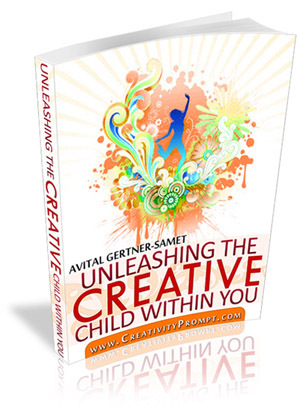 Get "Unleashing the Creative Child Within You" for just $12.95 and watch your creativity grows! I am so confident that this book will boost your creativity that I can offer you my unconditional 100% satisfaction guarantee. As you read every page and use all the tips and techniques, you'll notice how you become more and more creative. But if, for any reason, you don't get more creative after reading this book, then simply send me an email within 56 days of your purchase, and I will refund 100% of your purchase price, no question asked. That's how certain I am that you too will discover the joy of being creative.